Three buildings – one dating back to 1904 – have been transformed into a single cohesive office space. 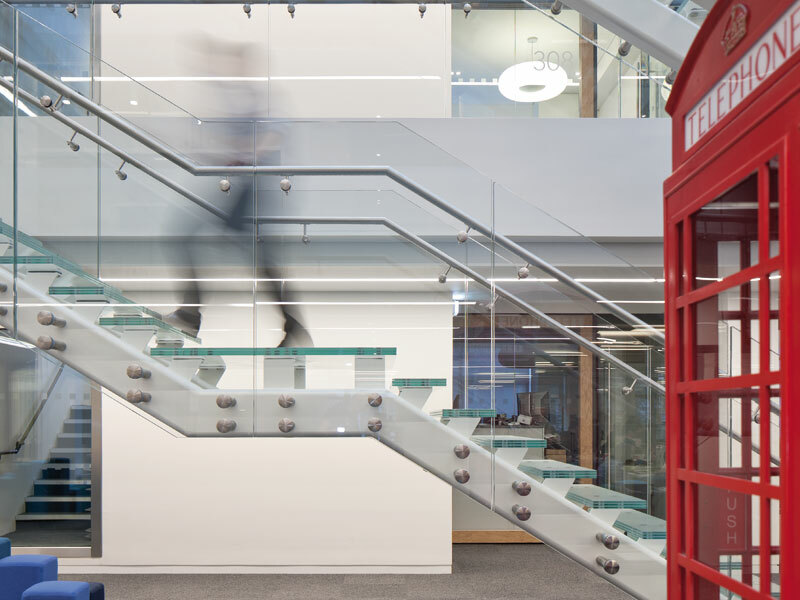 Forme UK and Marks Barfield Architects (MBA) have collectively adapted an iconic 1904 commercial building into contemporary office space. 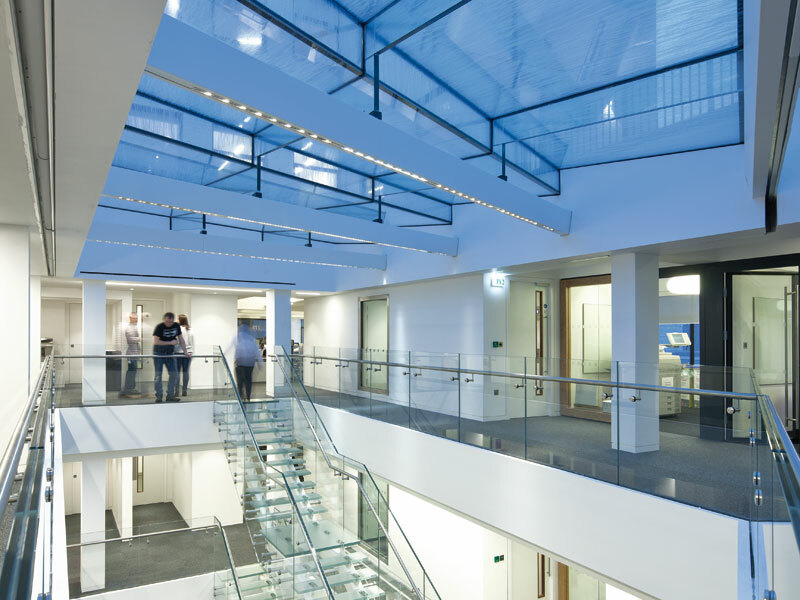 The project marks the third collaboration between the two practices, producing an energy and space-efficient open plan scheme, which includes a spectacular new atrium, interconnecting glass stairs and bio-diverse roof and roof terrace. 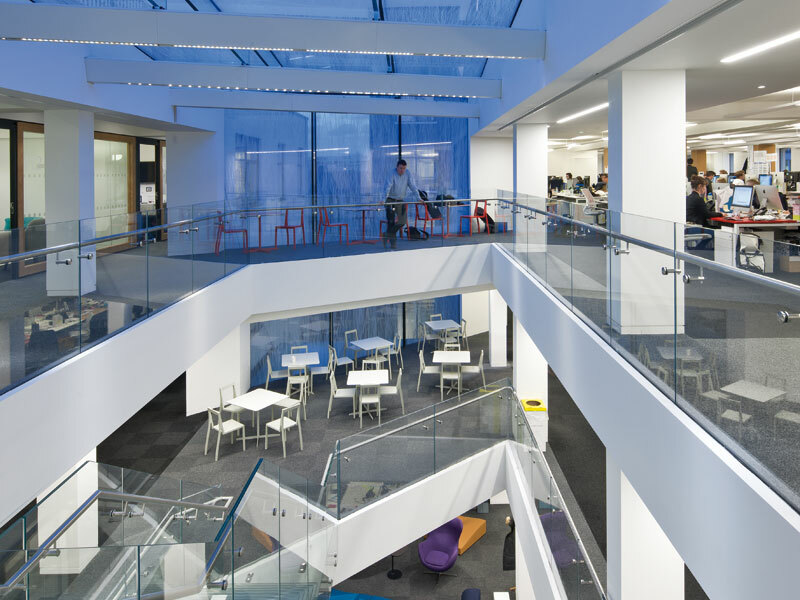 The project brief was to create a series of interlinked cohesive spaces within a former Marks & Spencer HQ, which occupied the building from the early 20th century and further developed it during the Thirties along with a neighbouring building. With the site owned by Lazari Investments, Forme UK designed the entire scheme while bringing in MBA to develop the atrium design, biodiverse roofs, terraces and facade. It's a natural union, it says. The team carried out several feasibility studies on behalf of the client before deciding on extensive structural amendments to the building. 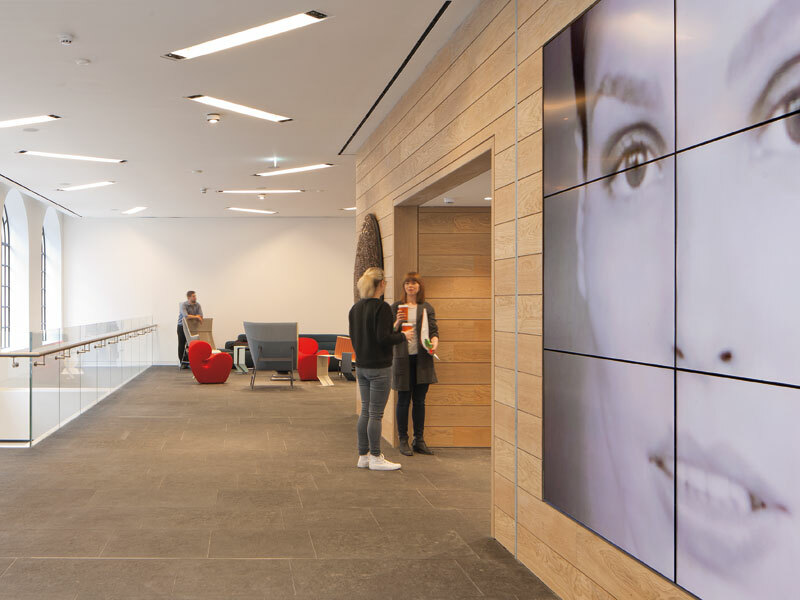 It implemented design concepts complementing both the building's heritage and the design-branding requirements of the current tenant, PR company Publicis Groupe. The reception area is made up of Alba Pearla stone augmented with rough-sawn oak boards, while black basalt flooring has been flamed to create an internal street-like pavement. 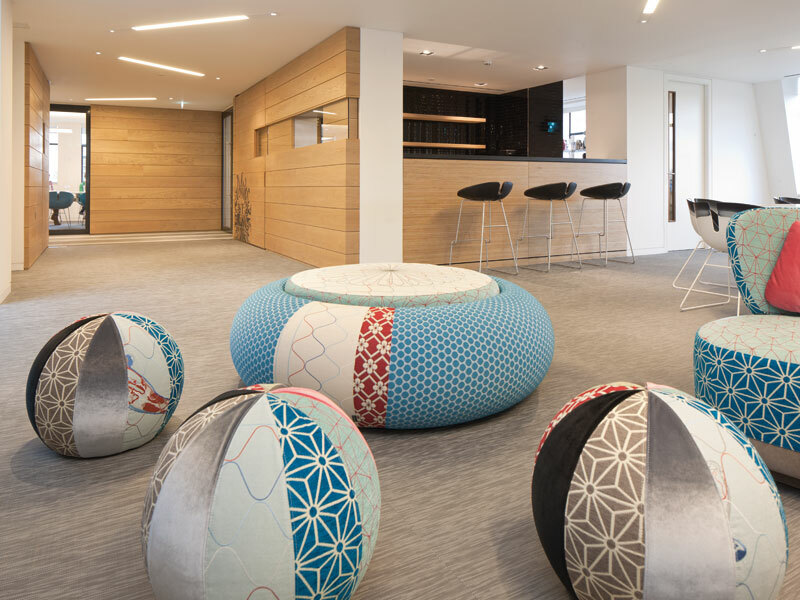 A reception desk from Isomi has been adapted to incorporate the Publicis Groupe logo, and a state-of-the-art projection system and ninescreen video walls have been fitted to various locations throughout the space. 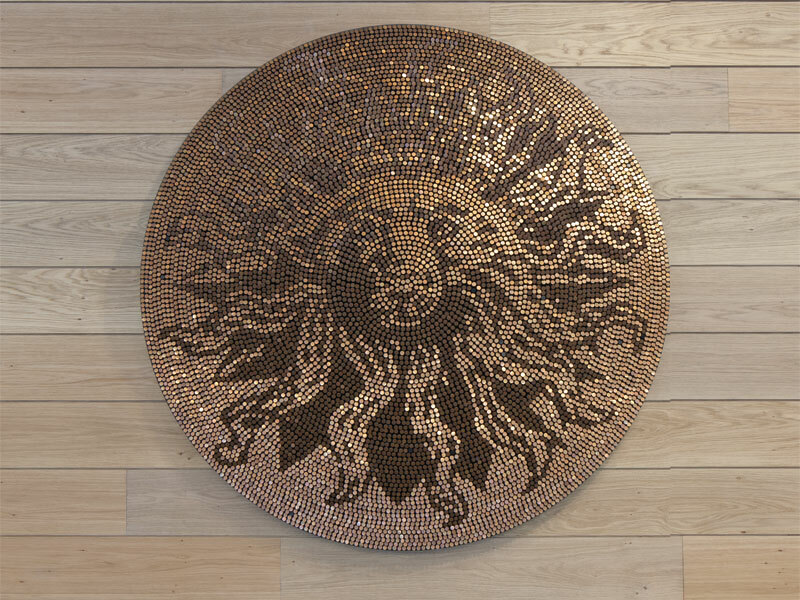 A striking lion head artwork from the Publicis Groupe logo was specially commissioned from the Giles Miller Studio. Comprising more than 12,000 individually crafted bronze ovalshaped 'pegs' cut at varying angles to create the lion figure, it features in the reception area. In the lower ground floors are the 'brainstorming rooms', which see a large light slot carved out of the floor on the main Baker Street facade, to increase natural daylight. Directly off the reception space is a client entertaining area, which comprises a flexible bar/cafe area with a kitchen and breakout zones. The bar is finished in plexwood with a Corian top and flooring from Bolon..
On the sixth floor a new presentation suite has been added with several multifunction presentation rooms, a fully fledged entertainment room and bar with access to new roof terraces. Finishes to the sixth floor emulate those of the ground-floor reception area, with the whole space adaptable for a major function or as individual presentation and pitching rooms. The newly accessible roof garden, with its wildflower meadow of 24 native plant species selected by an ecologist, bat boxes and bird boxes for swifts, sparrows and black redstarts among other feathered visitors, create an oasis of biodiversity in the middle of the city. It's a tranquil staff a getaway with spectacular views over London's roof tops. Crucially the building functions as a whole and has ease of access, thanks to the connecting features. 'The building now has a heart at its centre in the form of the new atrium and interconnectivity between each wing, and as a result is much more contiguous', says Twigg of the new glass atrium and bridges. The atrium provides a hub linking the three original buildings, the 1904 one being designed by Robert Lutyens as the Marks & Spencer HQ, while bridges at the second, third and fourth levels create physical links between the three. The atrium is made up of a frameless double-glazed system with an interstitial voile fabric to function as a 'veil'. The veil adds a degree of privacy for views in and out while providing a bright and airy space at the building's heart.